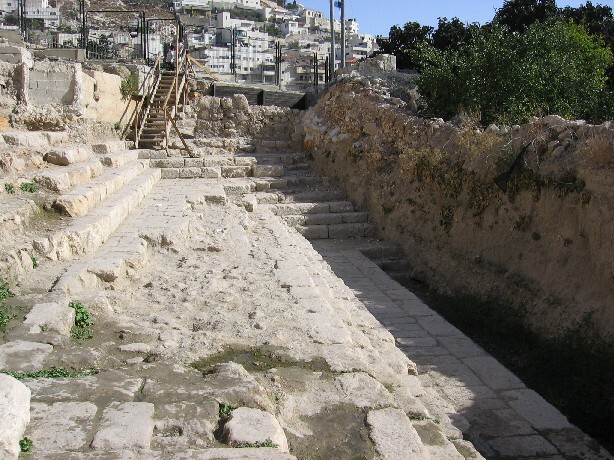 Just below the pool that was generally known as the Pool of Siloam, at the end of Hezekiah's Tunnel a find has been made, which is believed to be the original Pool of Siloam. It has been partially uncovered under an orchard. This pool is clearly of a much more likely scale considering its significance. This view is looking from the city out towards the Arab village in the far side of the Kidron Valley. This point is easily reached at the end of the Hezekiah's Tunnel walk, or by following the road down from the City of David into the valley and turning left.